This is something that’s been haunting me since the summertime, so it’s about time I got it done! I submitted the pattern a couple of places but no-one bit (likely because the beauty has more to do with the Handmaiden Silken – colourway Sangria here, by the way – ole!!! – yarn than the pattern!). So, I’ve decided that it should be my little midwinter blues-buster gift to myself and anyone else out there who cares to knit it. 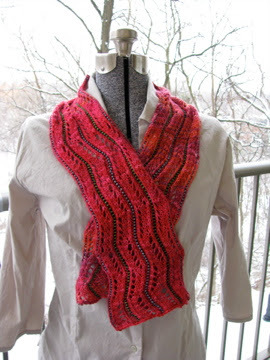 The pattern is heavily inspired by Sivia Harding, who created the wonderful River Rock Scarf (that pattern is found in the No Sheep for You book). 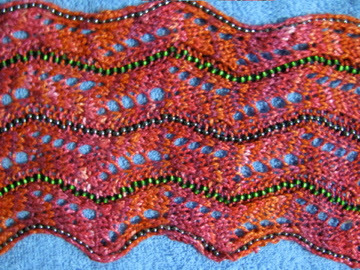 The zigzag pattern is modified from one published in a “Lace Primer” article by Eunny Jang in the Interweave Knits Summer 2006 issue. I ordered the beads from Earthfaire and I strongly suggest that you do the same if you’re going to attempt this pattern. The beads that Ellen provides are without compare (at least, in Toronto). The colours used here are gunmetal and olive gold-lined. 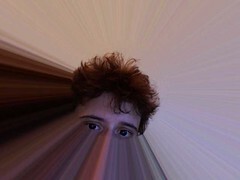 I’m reminded a bit of Bart Simpson’s head when I look at this photo! So, what’s next? A crown, perhaps?! 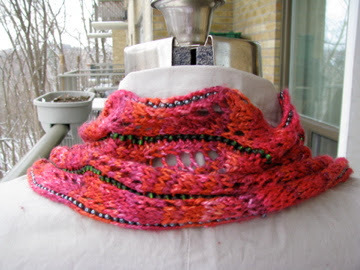 Hmm… The scarf as I made it took a bit less than one skein (100g/250m) of Handmaiden Silken and 750 beads. Dimensions are 40″ long by 5 1/2″ wide. Well, I’ll stop blatting on now, aside from to wish you all a happy (#$@&($*&@(#$*????) Monday – and to write out the pattern! Yarn: 250 -400 metres of DK weight silk or silk blend. The yarn used here is Silken by Handmaiden). I used a bit less than one skein (100 g or 250 m). 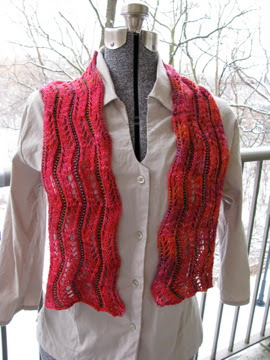 Tension: (approximate only) 20 sts and 22 rows = 10 cm (4″) one full pattern rep (20 rows) = approx. 15cm (6″) wide by 10.5 cm (4.25″) high (But don’t get stressed if you don’t get this tension! Given that this is lace, much will depend on what type of lace fabric you prefer, of course.) Instructions: 1. Thread the beads directly on to the yarn before you begin knitting. Of course, you can always skip the beads. However, I quite like them. 2. Begin knitting! legend: K = knit P = purl pb = place bead yo = yarn over k2tog = knit two stitches together ssk = slip slip knit (slip the next stitch, then the following, then knit the two slipped stitches together) Cast on 30 stitches loosely (I used the cable cast-on method). The pattern is repeated over 20 rows – the entire scarf as I knitted it is 250 rows long, with a half repetition at the end of the scarf. Knit the pattern: Rows 1, 3, 5, 7, and 9: P1, PB, *P1, ssk, K2, yo, K1, P1, pb* then repeat the part between the asterisks three times, then last stitch P1. All even rows (2 through 20): K1, *pb, K1, P5, K1*, repeat the part between the asterisks three times, then last stitch K1 Rows 11, 13, 15, 17, and 19: P1, PB, *P1, K1, yo, K2, K2tog, P1, pb* then repeat the part between the asterisks three times, then last stitch P1. 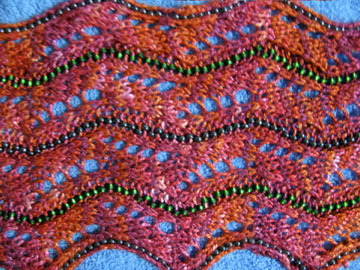 The pattern, when knitted, zigzags naturally like this: Repeat Rows 1 through 20 a total of 12 times, then repeat rows one through 10 once = 250 rows. Bind off LOOSELY (if you knit tightly, or you’re just beginning, it might help to bind off with a needle one or two sizes larger than what you used to knit the scarf). AUGHGHGHGGH! How do I place beads, you ask? Simple. The beads belong between the stitch preceding the “pb” notation and the one following. 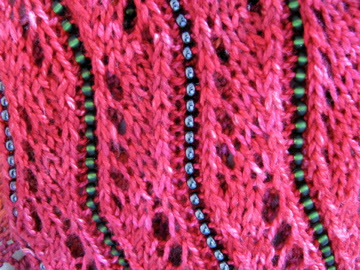 Just push one bead as closely as you can to the base of your working yarn, then knit or purl the following stitch as directed. Don’t worry if the bead appears loose – everything will fall into place eventually. Blocking: I use spray blocking for this type of piece. Grab a towel and place on a blocking board (or, if you’re like me, the floor on top of a towel). Spray the scarf generously with water from a spray bottle, then flatten out and ensure that all of your little peaks are looking perky and that your beads fall into line. Spray some more and then leave to dry. Want to know more about the Wacky World of Brouhaha? Check out my main page! Secret of the Stole II – progress!! Nice scarf! I am knitting a variant with a silk cotton yarn. A B A B A A B A B A A B A B A A B A B A etc I think that’s it?